Ordsall Chord Construction, Manchester, UK by Mike Peel, licensed under CC-BY-SA-4.0. Work is on the new Ordsall Chord has been continuing apace following the resolution, in the Court of Appeal, of a long running legal dispute regarding the impact of the scheme on a significant part of the country’s railway heritage: see Whitby v Secretary of State for Transport and others  EWCA Civ 444;  J.P.L. 980. 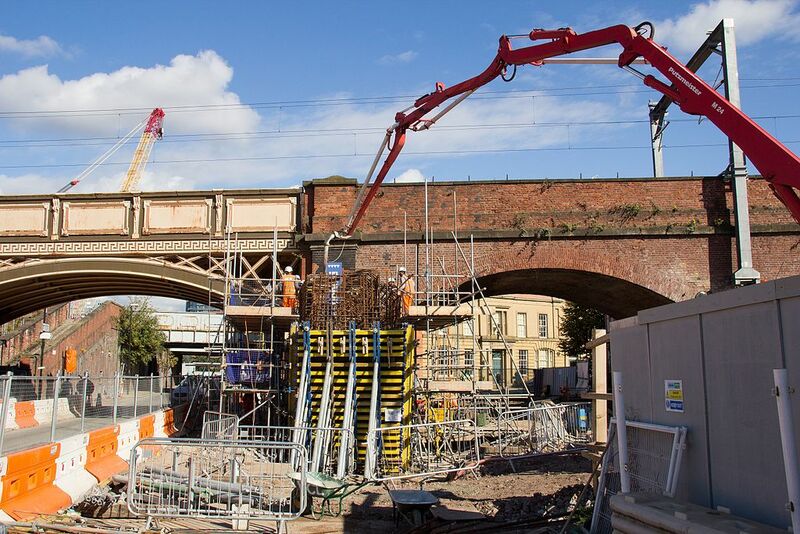 The Ordsall Chord will link together the two main rail routes running through Manchester. For the first time a link will exist between all three of the main stations in Manchester and will enable Manchester Victoria to alleviate some of the pressure on Manchester Piccadilly. In addition it will bring about massive increases in flexibility in terms of services and timetables and provide a vital component of the ‘Northern hub‘ and the longer term project to increase connectivity and efficiency in the region’so railways. At a high political level it forms a cog in the Northern Powerhouse strategy a vital element of which is improvement in connectivity between the great cities of the North. 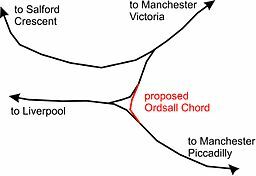 How the Ordsall Chord fits into the Northern Hub project. However, perhaps somewhat ironically, this 21st rail project risks despoiling its own heritage in that it will damage or spoil the setting of a number of grade 1 listed buildings associated with the Liverpool and Manchester Railway. The Liverpool and Manchester was engineered by George Stephenson and was the world’s first purpose built passenger carrying intercity railway. 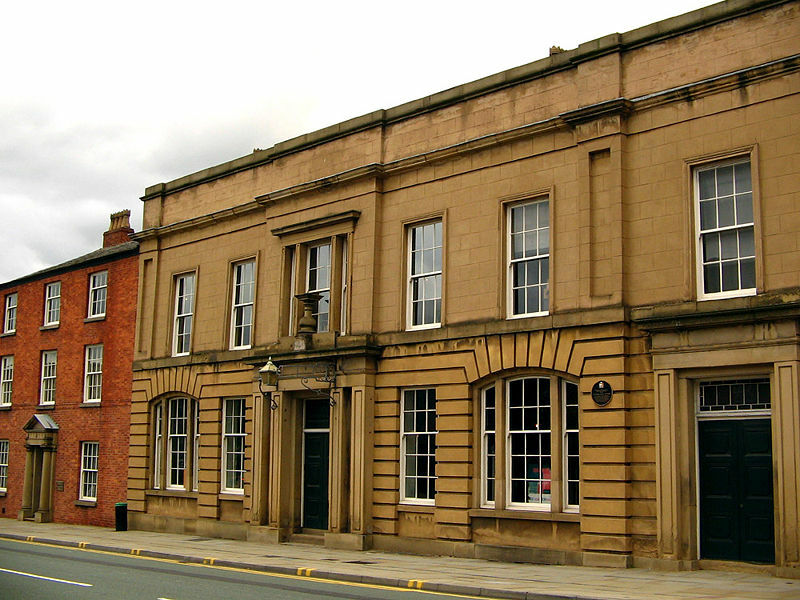 The buildings include the original Liverpool Road Station, the Station Master’s House, various bridges and viaducts, the ‘Power House’ and certain other buildings. Some of these buildings are occupied by the Museum of Science and Industry (MOSI). Liverpool Road Station in Manchester. 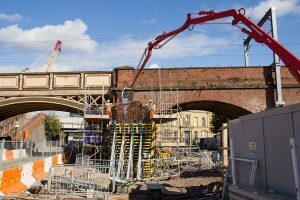 The project was authorized by way of an order made under the Transport And Works Act 1992: the Network Rail (Ordsall Chord) Order 2015 SI 2015/780. This was accompanied by various listed building consents necessary to interfere with the fabric or settings of the aforementioned structures. The ministerial decision set out in the order affirmed the recommendations of the planning inspector who had presided over a public inquiry into the scheme pursuant to procedures under the 1992 Act. The claimant sought judicial review of this decision on the grounds that the Secretary of State had failed to properly balance the benefits of the scheme against its deleterious effects on the heritage of the area. 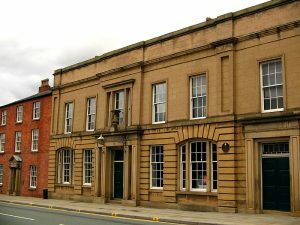 Moreover, he had not given due weight to an alternative proposal, the so-called ‘Option 15’, which would have largely avoided causing harm to the listed buildings. However, it had the disadvantage of cutting through a derelict area known as Middlewood Locks which Salford City Council had earmarked as the site for a major urban regeneration project.The claim was dismissed by the High Court, which could see no reason for impugning the decision of the Secretary of State: see Whitby v Secretary of State for Transport and others  EWHC 2804 (Admin) . The matter was then appealed to the Court of Appeal. The case hinged upon the correct interpretation of several provisions of the Planning (Listed Buildings and Conservation) Areas Act 1990. In short, these require the Secretary of State to pay special attention to the desirability of preserving buildings, their architectural features and settings both within and without conservation areas. Lindblom LJ agreed with the planning inspector’s findings which had been heavily relied upon by the Secretary of State. In particular, the planning guidance (PPS5) which seeks to flesh out the statutory duties and the planning inspector’s interpretation of it was endorsed. A key aspect of the guidance focuses upon reasonableness and whether ‘there is no other reasonable means of delivering similar public benefits.’ The inspector was right to conclude that, due to its impact on the Middlewood Locks development, it was doubtful whether Option 15 could be regarded as reasonable alternative. Another important issue raised by the inspector was that Network Rail had already rejected Option 15 and there was no proposal on the table. Furthermore, Network Rail had indicated that it was doubtful whether an Option 15 proposal would be promoted, even if their application was rejected. Whilst Lindblom LJ accepted that this was a relevant consideration he clearly found it less convincing and attached far more weight to the Middlewood Locks issue – see para . On a fair reading of paragraphs 873 to 880, in particular paragraphs 875 and 880, he found the harm to regeneration associated with Option 15 sufficient to exclude that alternative as a “reasonable means” of delivering the public benefits of an Ordsall Chord and as an “appropriate alternative site”. Inherent in this conclusion is that the harm to regeneration associated with Option 15 was, in his [the planning inspector’s] view decisively greater than the harm to heritage assets of the highest significance associated with the order scheme. There is, and can be, no challenge to any of these conclusions. They represent an entirely reasonable exercise of planning judgment. And the reasons given for them were perfectly adequate and perfectly clear. Overall the division shows that, where planning decisions are finely balanced, it can be very difficult to challenge the judgement of the decision maker. As Lindblom LJ put it at para , ‘this as a classic case exercise of decision making judgment…’ The test for impugning the judgment of the decision maker in judicial review is very onerous and is based upon irrationality. However, one aspect of the case that is worthy of note is the fact that, if the application was rejected it might spell the end for the entire scheme because Network Rail had already rejected the Option 15 proposal and had indicated that no alternative proposals would be forthcoming. This raises the issue of whether, where major infrastructure projects upon which many political and economic aspirations are pinned, developers can exert pressure on the decision maker by saying ‘it’s this or nothing’ (although there is nothing to suggest that the promoters consciously pursued such a strategy in this case). This is a difficult issue and it is interesting to note that, whilst the planning inspector attached some weight to the fact that no alternative proposals may be forthcoming, the Court of Appeal downplayed the issue somewhat and regarded it as a ‘consideration’ but not a ‘critical one’ – see para . Thus, had it not been fore the Middlewood Locks Development, it seems that the matter might have been much more finely balanced.